Students at Lindley Academy Charter School in Philadelphia received free backpacks and school supplies on January 15, Martin Luther King Day. Gibbel Kraybill & Hess LLP, through its Ardmore office, partnered with The World Was Made For You Inc. to provide funding for the items that were distributed. The World Was Made For You Inc. is a nonprofit organization founded by author and Ardmore native Nahjee Grant. “We can see that kids still don’t have what they need during the year. Most drives are in the beginning of the school year, so this is a great way to make sure kids have what they need going into the second half of the year and can finish strong,” said Grant. This is the second event the organization has planned for Lindley Academy, the first being a turkey and book giveaway for Thanksgiving in 2017. 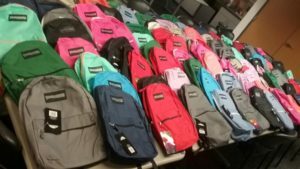 The World Was Made For You Inc. has donated backpacks, supplies, food and books to some 2,500 Pennsylvania students since the organization was founded in 2017. “GKH is pleased to support local initiatives like this, which put much-needed supplies directly into the hands of those who need them,” said attorney Peter Kraybill, an Ardmore native who oversees GKH’s Ardmore office, located at 32 Parking Plaza in Suburban Square.